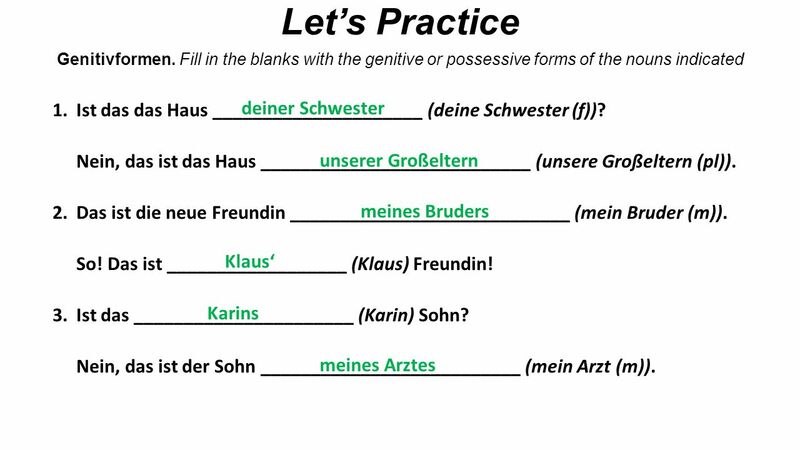 possession, ownership, belonging to or with: Hier ist das Auto meines Vaters. Here is my father’s car. Hast du die Freunde meiner Schwester gesehen? Did you see my sister’s friends? 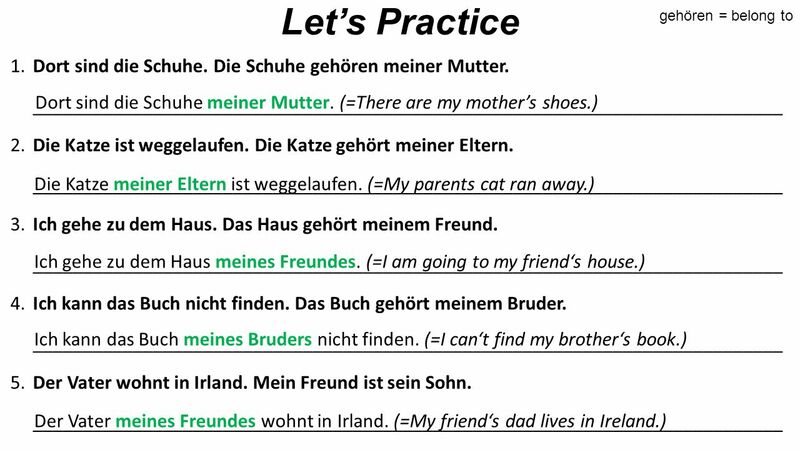 “of” in English, when referring to a part or component of something else: Am Anfang des Kurses haben wir viel gelernt. We learned a lot at the beginning of the course. Manche Seiten des Buches fehlen. Some pages of the book are missing. 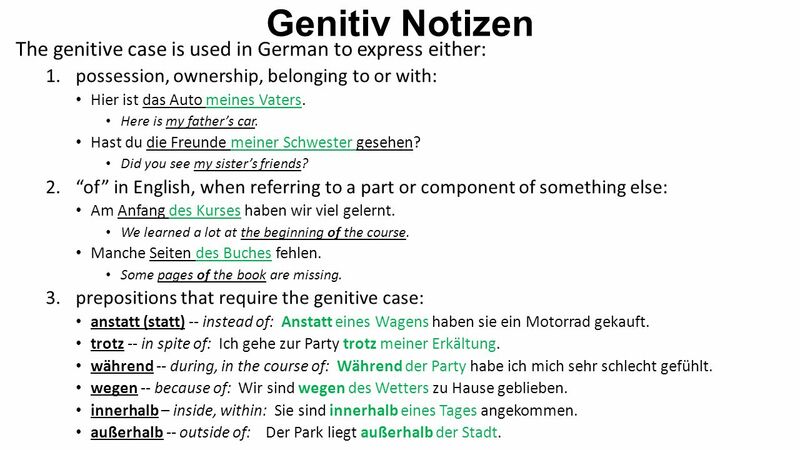 prepositions that require the genitive case: anstatt (statt) -- instead of: Anstatt eines Wagens haben sie ein Motorrad gekauft. trotz -- in spite of: Ich gehe zur Party trotz meiner Erkältung. während -- during, in the course of: Während der Party habe ich mich sehr schlecht gefühlt. wegen -- because of: Wir sind wegen des Wetters zu Hause geblieben. innerhalb – inside, within: Sie sind innerhalb eines Tages angekommen. außerhalb -- outside of: Der Park liegt außerhalb der Stadt. 4 Word of warning: Your impulse may be to simply put an -s before a noun to indicate the possessive, as we do in English (my father’s car). However, saying “mein Vaters Wagen” is incorrect. You must rephrase: “der Wagen meines Vaters”. 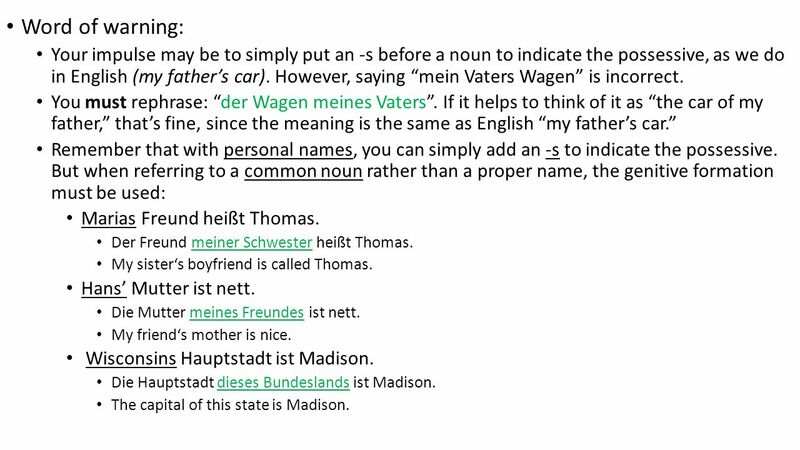 If it helps to think of it as “the car of my father,” that’s fine, since the meaning is the same as English “my father’s car.” Remember that with personal names, you can simply add an -s to indicate the possessive. 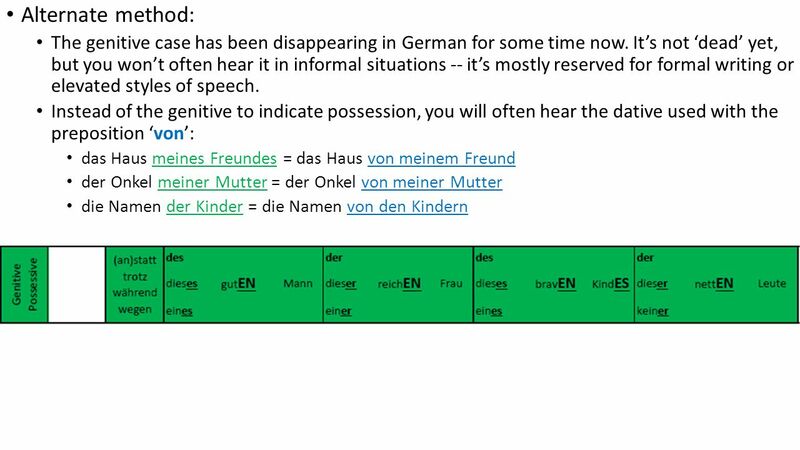 But when referring to a common noun rather than a proper name, the genitive formation must be used: Marias Freund heißt Thomas. Der Freund meiner Schwester heißt Thomas. My sister‘s boyfriend is called Thomas. Hans’ Mutter ist nett. Die Mutter meines Freundes ist nett. My friend‘s mother is nice. Wisconsins Hauptstadt ist Madison. Die Hauptstadt dieses Bundeslands ist Madison. The capital of this state is Madison. 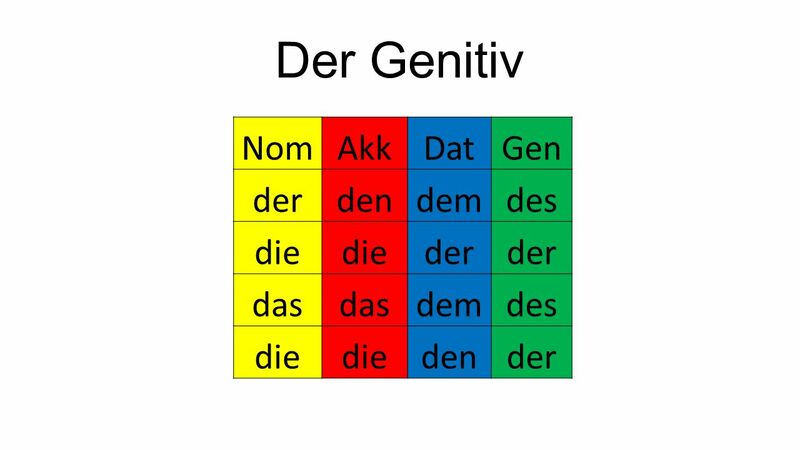 Herunterladen ppt "Der Genitiv Nom Akk Dat Gen der den dem des die das"
Verben 1 Genitiv Präpositionen GenitivDer Wörter Potpourii. Die Frage des Tages All make-up work due by If you need to make up a quiz. You may do so before school Thursday, or Friday, or after. Wie groß ist deine Familie? DATIV Ich schreibe meinem Bruder einen Brief. 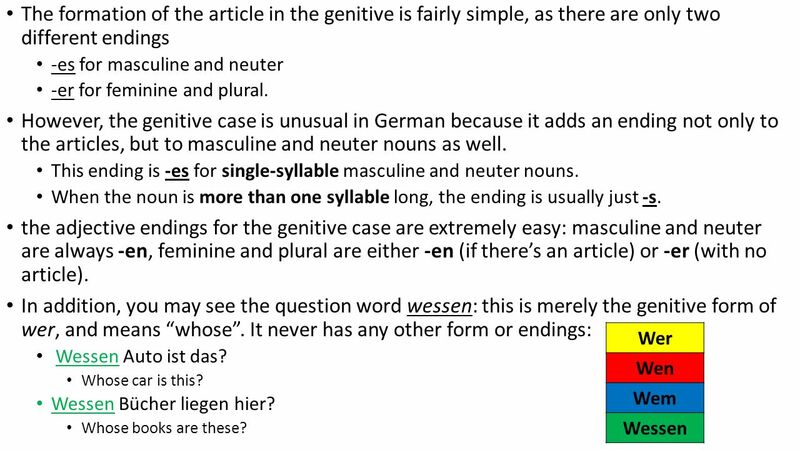 GERMAN 1013 Kapitel 2 review. Montag, den Hausaufgabe für Dienstag den LB 10.3 E-G; LB 10.3 H oder J (Aufsatz) Quiz 10.3 Guten Tag! 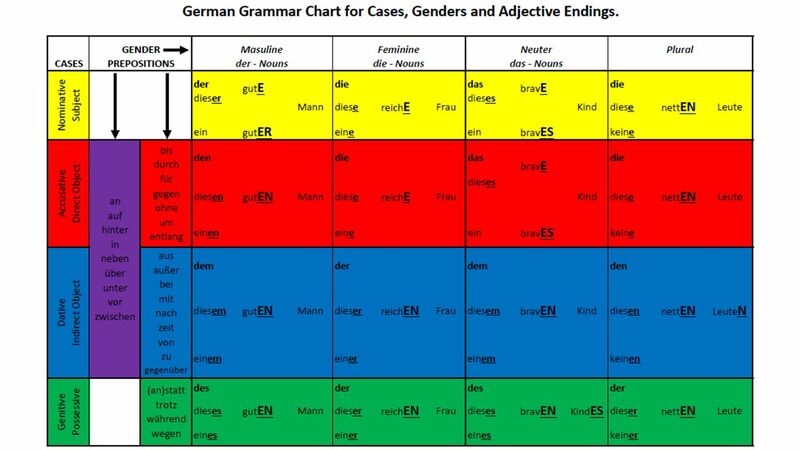 The Nominative Case Forms/Endings of the personal pronouns.